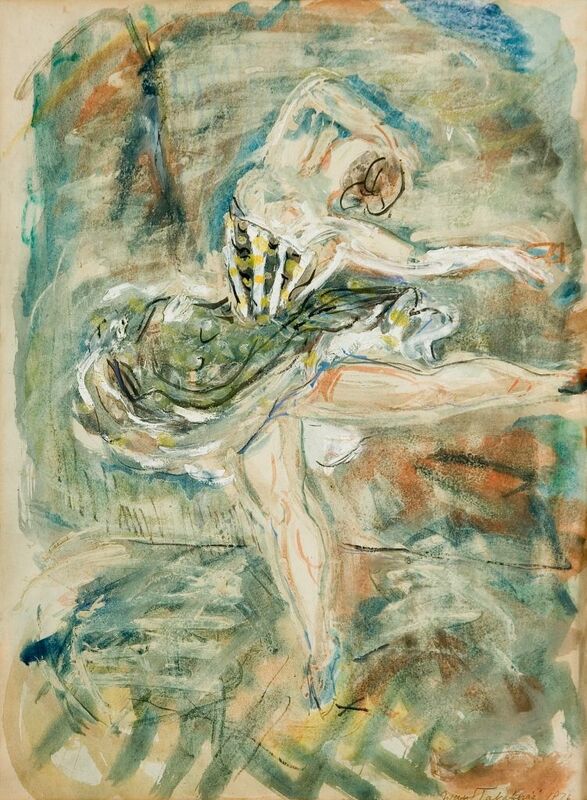 Note: Under the title Dancer the work was purchased directly from the artist in 1955. 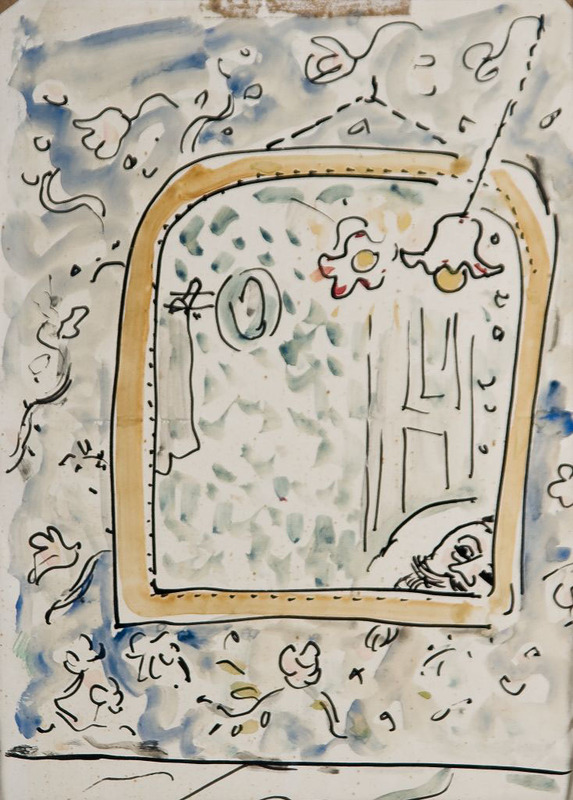 Tabaković’s watercolours, temperas, gouachesreflect the artist’s vision of the world, sometimes based on scientific findings. His idea of linking art with sciences, although unique in the Yugoslav and Serbian art of the twentieth century, was present in his work from the very beginning. Ballerina and Three Women in White are paintings from the inter–war period. Colder colour scale, broad, dynamic coats of paint, the light and a lyrical note are characteristic of the Three Women in White. A colouristic subtlety and white light are present in both these works and also in his works in general. 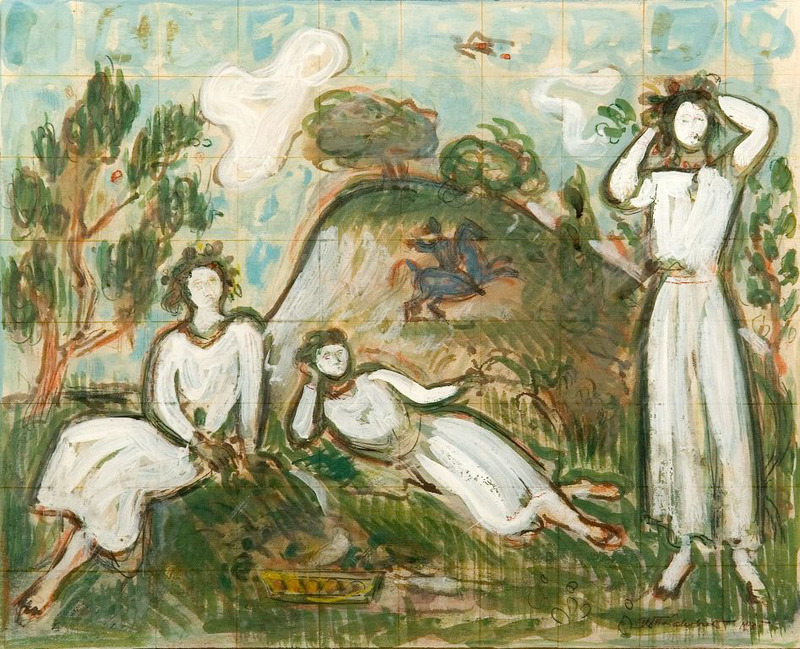 The documentation of painting the Three Women in White confirms that is a sketch for a ceramic panel. The watercolour Study, possibly a sketch for a larger work, is executed in dynamic, rapid strokes in greyish blue and ochre hues. The Seaside Landscape from the 1960s is completely different from other Tabaković’s works from the same decade. 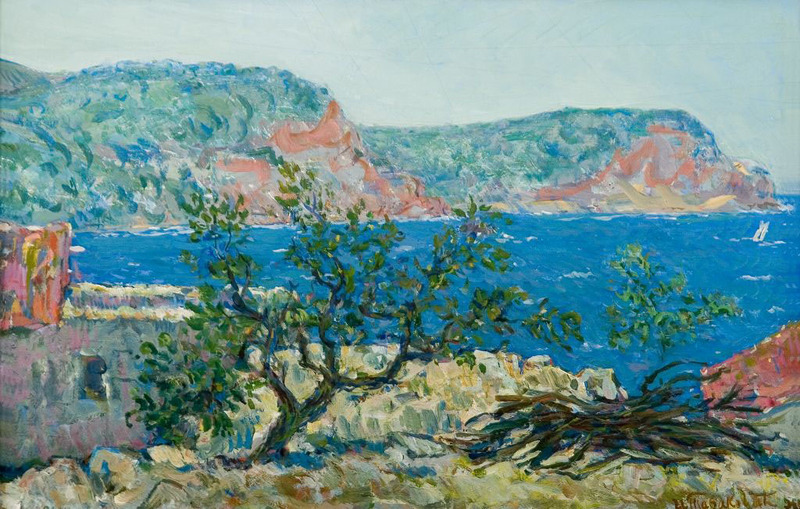 The painting represents countryside with an olive tree in the foreground and a cove and rocks in the background. By its atmosphere and its style, the work is much closer to Tabaković’s works from the 1930s: it has a quivering light, lively colours, and the colour scale of blue, pink, grey and green. Ivan Tabaković. – He was born in Arad and began to study painting in 1917 at the Academy of Fine Arts in Budapest with Elekes Ödön. After the end of the WWI he continued his education at the Academy in Zagreb with professors Maksimilijan Vanka and Ljubo Babić. In 1922 he travelled to Munich where he attended two semesters of courses at the Academy, and privately with Hans Hofmann. He returned to Zagreb and in 1924 graduated from the Academy. In 1925 he opened a private school with Oton Postružnik. In 1927 he worked as a draughtsman at the Anatomic Institute of the School of Medicine in Zagreb. Three years later he moved to Novi Sad where he lived (with a short interruption in 1934 for a visit to Paris) until 1938 when he moved to Belgrade and began to teach at the School of Applied Arts. After the liberation he worked first at the Academy of Fine Arts and from 1948 at the Academy of Applied Arts. He was one of the founders of the group Zemlja (Earth) in Zagreb (1927), as well as of the groups Dvanaestorica (Twelve Artists, 1937) and Šestorica (Six Artists, 1954) in Belgrade. He exhibited in Yugoslavia and abroad: Paris, London, Barcelona, Warsaw, Rome, Philadelphia and in other art centres.